As the dead line for candidates almost comes to a close the latest pre-mud slinging events are coming to light. Oh dear oh dear. Looks like an old candidate is back and on form going around and commenting what could happen to other candidates and their families. You know who you are as you will also know you cannot be fully reveled until the closing date. Ready! If what has been mentioned tonight is correct congratulations are in order. 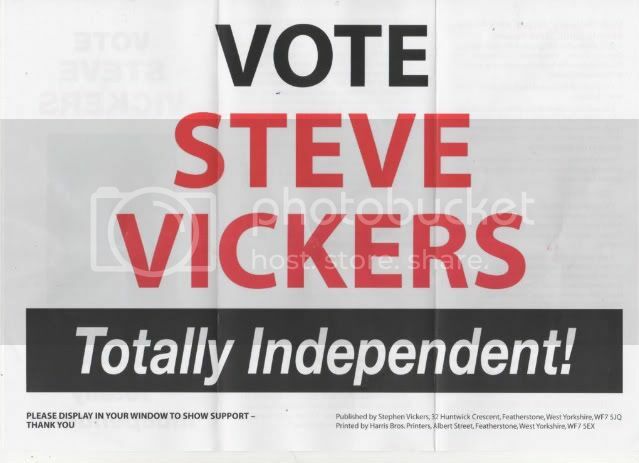 Steve Vickers, Independent for Featherstone. Good luck you have my vote. Just got some more free bog paper…. 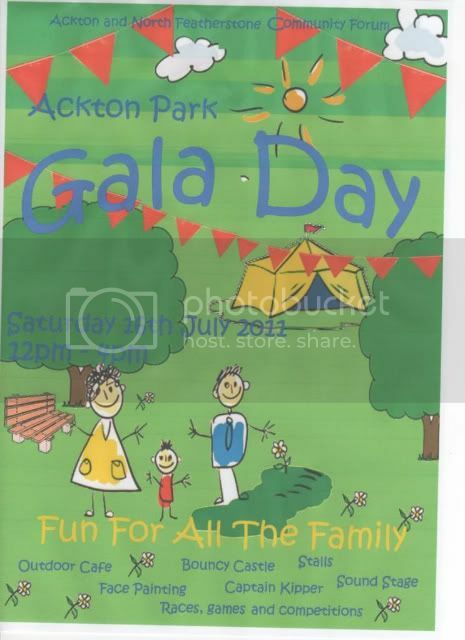 Something must be wrong as the Labour are really scrapping the barrel this time…. Or is it just there hope to get back to the old days of nodding yes men with as little gain for the town as the 25 years they had before. The Indy slaging off is a cracker. Sure the answers will arrive as the lies are so blatant. There will always be dirty tricks…. 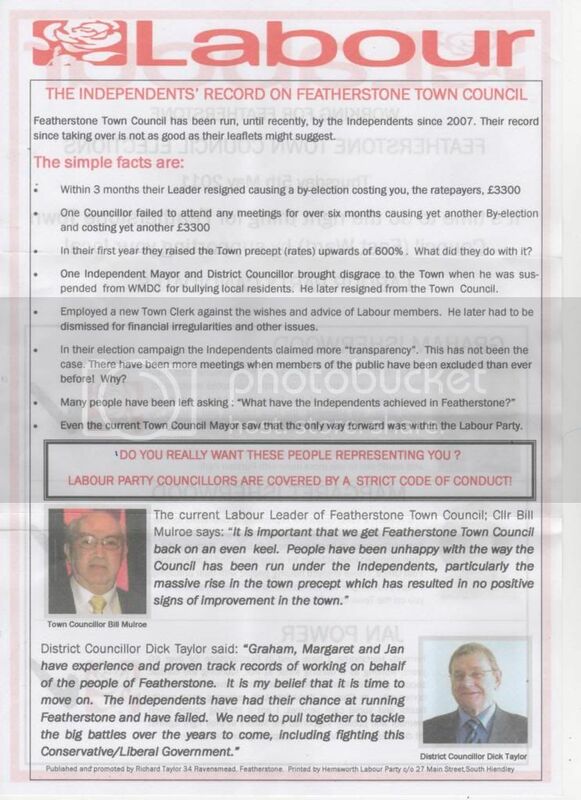 And there will always be Featherstone Labour party dirty tricks…. You as a tax payer paid for the Featherstone sign boards to be fitted. This week’s dirty trick is the rules have changed for putting posters up. The Sir Geoff football day this Saturday has been worked around; “missed being passed in the last council meeting”. Ironic that every Labour Cllr, Inc ex Indy, who has been given a poster, has made sure it’s not displayed. What else should Featherstone expect? out of the candidates listed who do i vote for!! I can either vote labour and help enpower a man to cause future misery on our once proud towns and villagers, or independant for Mr steve Vickers, who on the occasions i have met him seemed a level headed down to earth genuine guy....but since his election leaflet dropped through my door ive heard alot of rumours. WHY IS POLITICS SO HARD I JUST WANT SOMEONE HONEST WHO WILL DO THE RIGHT THING FOR THE PEOPLE THEY REPRESENT AND NOT LOOK TO FEATHER THEIR OWN NEST!!! HEEELLLPP! Been enjoying your comments Alf and was just responding to your post when it was edited. Before anyone else asks your last comment has been removed by the Guardian as it was liable. What you have said are good comments that many people reading the many leaflets will think. To continue Featherstone (ward 6) elections have been an education for years, especially the last 8 years. Have to agree with your comments on both sides. What I have seen of Steve and his community work has been level headed, without fuss and the publicity wagon. Normal guy on a normal street with a normal job. Definitely not like Featherstone Labour. Rumors and bad press without fact are what the Featherstone Labour party is good at. We all pay M.P. John Tricket thousands of pounds for his office to create borderline legally checked crap that is printed by tens of thousands. The bad pr against Steve is as usual personal. Who else but Labour would pick on a mans health? Good job the N.H.S. worked. Don’t people get better? Politics around Featherstone will never be easy but again over the last 8 years the people have made a difference. The factual track record of Labour party member Graham Isherwood is what it is… not white. Is the answer try what you know and don’t like (Isherwood)? Or try something new (Vickers)? 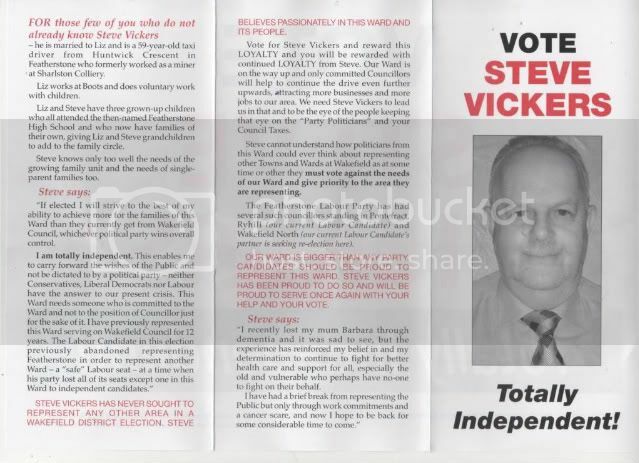 Not quite sure on this one but is this person the same Steve Vicars who was Labour Former town council leader and district councillor for Featherstone? certainly didnt mean to upset Mr Vickers as like i said i have met him on many occassions and always found him down to earth and level headed..The rumours i heard wernt given to me by labour but by a old business partner of his..I hope they are not true bcos i will be voting for him and really hope he has the courage to stand tall and help in the revival of featherstone and my own village..bcos LABOUR certainly wont!! well ive voted for Vickers if he gets in i hope he has the decency and courage to stand tall and do what needs to be done..
Steve got my vote also. Would be good to hear his voice. Respect for anyone normal standing around here. Talking of respect it was strange to see “Binnersley….Independent”. Got to take my cap off to Paul or anyone fighting Jan Power and the Isherwoods. I bet Kay got some grief for that one off Peter Box and Tricket. Looks like back to the dark ages for a while….. 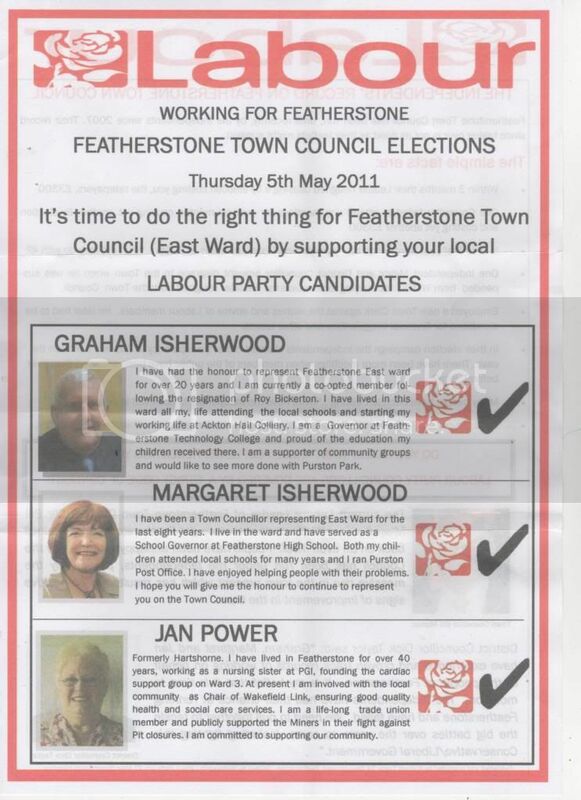 Most worrying for Featherstone will be Labour Party member Jan Power and her complaining helped of course by her husband Brendon Power. This should now cost us out of the Featherstone precept many more tens of thousands of pounds. Just what we need! Paul lost by 11 votes, so the town council now has a member who has caused countless disuption to the council over the past 4 years. .... sorry have had to delete what I had put here, not worth the risk....!Give Steve his due he had a go and given the fact that Labour were favorites to have had wins all over the district he was out on a limb. Pity the sheep pens were left open. Bottle of wine to the first person to report Jan to the Standards committee. Surely we can go to a full case........for such a worthy cause! Noticed there was 14 spoiled votes, now that makes you think ?